This remarkable postcard showing Houdini making The Man From Beyond in Lake Placid, New York, sold this morning on eBay for $1,424.99. The card was made by I.L. Stedman of the Lake Placid Club and shows Houdini with actors Frank Montgomery and Erwin Connelly. It's unclear if this is a behind the scenes shot or an unused scene. (In the finished film, Howard Hillary never makes it into clothes during this "Arctic" sequence.) Either way, it's a rare image from this location and a real gem. 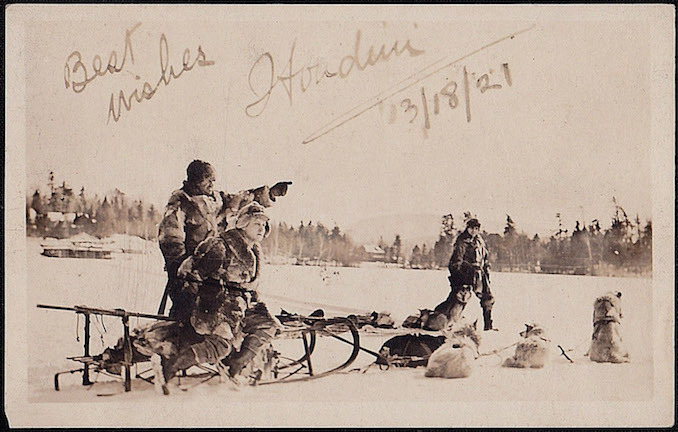 Another exciting feature is that Houdini's signature (which the seller could not say was original to the card or part of the photo image) provides a date for the Lake Placid shoot. March 18, 1921 would put it at the start of The Man From Beyond's 17 week production. It actually pre-dates the official announcement of the Houdini Picture Corporation. But it's likely Houdini needed to film these sequences early to catch the Adirondacks snowfall. Congrats to the winner of this important and unique piece of Houdini movie history.